Posted on May 19, 2017 , in Fitness Equipment. If you’ve never used a kettlebell before, it probably seems confusing, but with a few tips you’ll be using yours like a pro in no time. Below you’ll found out the kettlebell basics you need to know to get started. A kettlebell is a weight made of cast iron in a spherical shape. 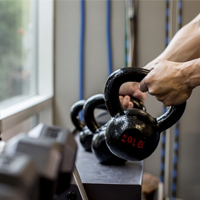 Kettlebells can range from 4 to 175 pounds and can feel difficult to lift even at a low weight because they are shaped differently than a hand weight. Because it is somewhat difficult to use, a kettlebell can improve your strength, balance, and power. It can also increase your grip strength and build your back, legs, and shoulders. When first using a kettlebell, you’ll want to start slow to reduce your chances of injury. Keep your feet firmly planted with your weight in your heels. Always avoid lifting a kettlebell over your head as if it falls, this can be extremely dangerous. When you bend to lift the kettlebell, avoid slouching your lower back. Use your legs and hips to generate force. A kettlebell swing is among the most popular kettlebell exercises. Start with your feet shoulder width apart, holding the kettlebell with two hands. Lean forward so the kettlebell is hanging between your legs. With your feet still planted, push up from the ground, letting the power from your legs help you swing the kettlebell in front of you with your arms straight. Thrust your hips forward, swinging the kettlebell up to head level and then reverse the motion to arrive back at the start position. Continue to repeat this exercise, increasing your repetitions as you improve. As you gain strength, you can also do kettlebell swings with one arm and then the other. If you want to do a complete workout that will develop both strength and cardiovascular endurance, try warming up for 5 minutes. Complete 10 kettlebell swings with one hand, followed by 30 seconds of hard cardio like jumping rope or using a stationary bike or treadmill. Do 10 kettlebell swings with your left hand and then 30 seconds of cardio. After this, do 10 push-ups, 10 pull-ups, and start over. Do this circuit 3 to 5 times for an outstanding workout. Now that you know a little more about kettlebells, download our monthly promotion to save money on kettlebells and other fitness equipment.